Come to Italy and join me for a memorable painting experience in the lovely Tuscan hills! 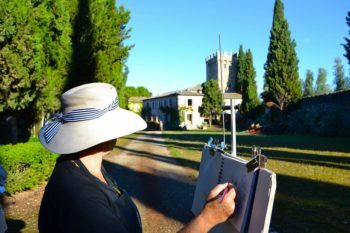 You will learn the fundamentals of watercolor painting while capturing the many moods of the Spannocchia Estate. Previous painting experience not necessary. You will acquire skills as you practice seeing. Lessons include a demonstration on the subject or style for the day, and frequent critiques will guide your progress with style and development of paintings. We will travel to nearby cities, exploring market days, architecture and art. Sketchbook recording of our sights will be a plus! This is a ‘destination vacation’ where you can soak up culture and language, dine on native Tuscan foods in historic surroundings while you live on the 1100 acre estate. We will have a guided tour of the facilities, historic details included. We can opt for other enrichment: cooking class, touring there farming of Cinta Sinese (famous Tuscan Proscuitto Pigs) with tasting, olive oil and or wine tastings…..massage anyone? Lots to do! Doris Rice is an acclaimed international watercolor painter and teacher who lives on the Seacoast of New Hampshire and paints on location throughout North America and Europe. She is a graduate of Moore College of Art in Philadelphia. Since relocating from Philadelphia to North Hampton, NH years ago, she has focused on plein air [on location] work, traveling to study with various master painters. Her work is in many international collections and may be seen at: Wood Gallery/Art and Frames, Orange Ave, Coronado as well as Kennedy Gallery, Portsmouth, NH.